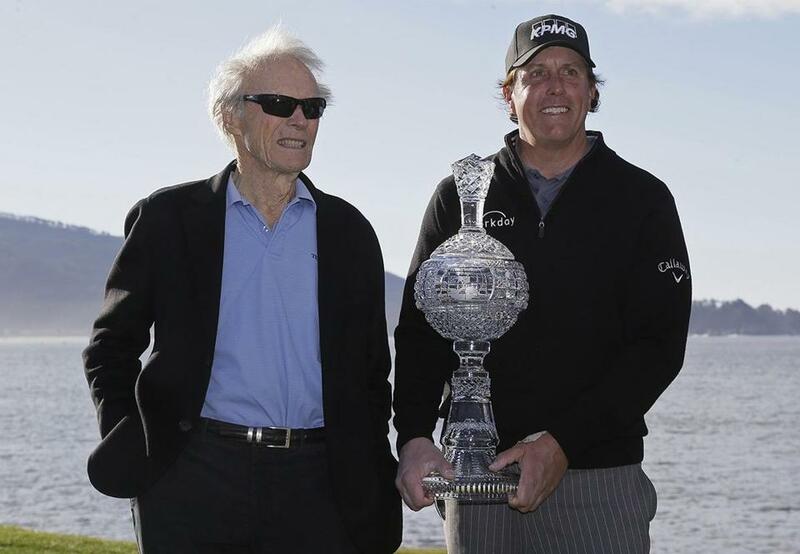 Actor Clint Eastwood (left) joined Phil Mickelson for the trophy presentation. Play suspended at Pebble Beach with two holes to play Sunday. ‘‘It’s a lot more work and effort to play at this level,’’ Mickelson said. ‘‘And I have believed for some time that if I play at my best, it will be good enough to win tournaments. The challenge is getting myself to play my best. It’s a lot more work off the course, it’s more time in the gym, it’s more time eating, it’s more time focusing, it’s all these things that go into it. Making it even more special is Pebble Beach, where he made his pro debut at the US Open in 1992, where he won the first of his five titles in another Monday finish in 1998 — this one in August because of rain. It’s where his grandfather, Al Santos, was among the first caddies when the course opened in 1919, and Mickelson still uses as a marker the 1900 silver dollar his grandfather kept in his pocket to remind him he was not poor. Mickelson, who started the final round three shots behind, never came close to a bogey and built a three-shot lead through 16 holes Sunday night when it became too dark to finish. 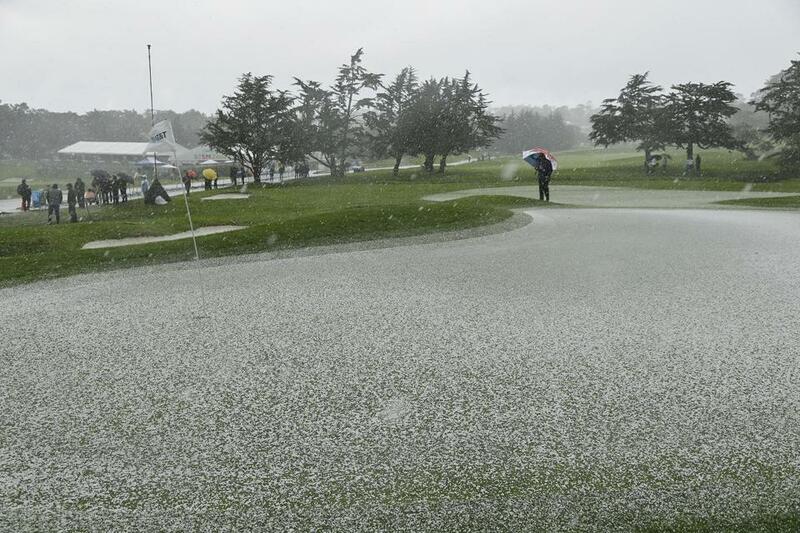 Hail covered the second green at Pebble Beach for a time Sunday. Mickelson said he could ‘‘see just fine’’ even after sunset, knowing darkness falls quickly on the Monterey Peninsula. Casey could barely see the 3 feet of grass between his ball and the cup on the 16th hole and said there was no way to complete two holes in six minutes. Mickelson was on the 17th tee, shaking his head when he heard the siren to stop play. When they reconvened Monday, Mickelson completed the last two holes and finished at 19-under 268. Casey needed Mickelson to make a big blunder on the two closing holes, and there was little chance of that. Casey at least birdied the 18th for a 71 to finish alone in second, the difference of $152,000. But the final day, and all week, was about the ageless Mickelson. He says he had as much fun winning at Pebble Beach as when he finished one shot behind in the Desert Classic three weeks ago. It’s the thrill of competition. And even at 48, that never gets old.